For centuries, the world of Safehold, last redoubt of the human race, lay under the unchallenged rule of the Church of God Awaiting. The Church permitted nothing new - no new inventions, no new understandings of the world. What no one knew was that the Church was an elaborate fraud - a high-tech system established by a rebel faction of Safehold’s founders, meant to keep humanity hidden from the powerful alien race that had destroyed old Earth. Then awoke Merlyn Athrawes, cybernetic avatar of a warrior a thousand years dead, felled in the war in which Earth was lost. And now the fight is thoroughly underway. The island empire of Charis has declared its independence from the Church, and with Merlyn’s help has vaulted forward into a new age of steam-powered efficiency. Fending off the wounded Church, Charis has drawn more and more of the countries of Safehold to the cause of independence and self-determination. But at a heavy cost in bloodshed and loss - a cost felt by nobody more keenly that Merlyn Athrawes. This was are very tough review for me. My first impulse was to give it only two stars, but I ultimately awarded a third. The easiest way to explain my opinion is to supply simple pros and cons list, so here goes. 1. 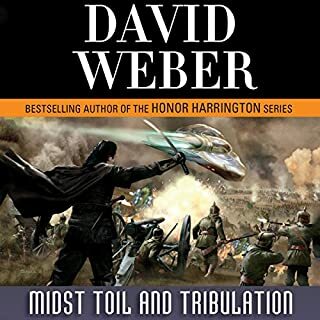 Weber spends a lot of time discussing the details of war that are often overlooked (This is also a con and I'll explain why in the cons list). The importance of manufacturing, uniform measures, supply routes, intelligence, and a myriad of other details are both interesting and rarely come up in the genre. 2. The history of technological development and it's impact on the world is also very interesting and rarely covered in the science fiction world. 3. The underlying plot is very engaging. I really want to see what happens when and if the grand inquisitor finds out the truth. I am curiouser and curiouser about the alien species that nearly destroyed humanity. 1. The things interesting in #1-2 above become drudgery after getting the details hour after hour. At times I felt more like I was reading a dry history textbook than a novel. The great characters and plot are crowded out by ceaseless discussion of how long it takes to manufacture a gun and why cavalry rant as good in war as you might imagine. Even well researched info gets boring after a while. 2. Most of the endless discussion from the first con, is delivered in prose. Sometimes whole chapters slip by with almost no dialogue at all! 3. The main plot is moving along about the same rate as Jabba the Hut in a foot race. In the last several novels very little has actually happened. A subtitle for several of the books might be "The War continues". Honestly, I still think it deserves a 2 star rating, but I am interested enough in the plot I'll probably read the next one. I have a hard time giving two star to a novel if I plan to read the next book in the series. There are glimmers of greatness that keep me ganging in there. I am hoping it will suddenly improve and I'll be glad I hung in there. Books 8-10 of Wheel of Time made we want to give up too, but I'm glad I kept reading. I'll hang in there and award 3 stars. Oliver Wyman makes the perfect narrator! 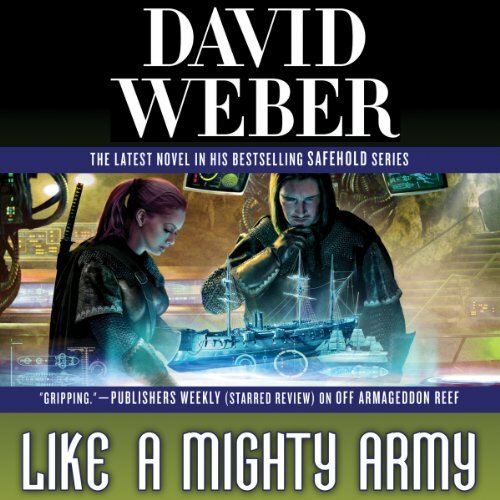 Would you consider the audio edition of Like a Mighty Army to be better than the print version? This is a long book. Having a narrator that you want to listen to is essential if you want to finish it. As a commuter, print books are not high on my list. 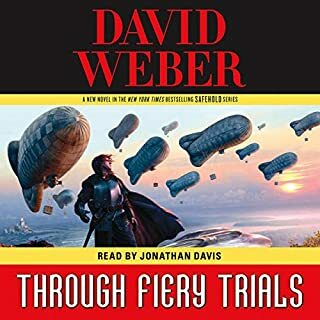 However, a good David Weber book with a good narrator always is. Oliver Wyman brings the characters to life. His use of different voices allows the listener to better "see" the book in person. It also helps that he adjust his voice to match what you think the character actually looks like. 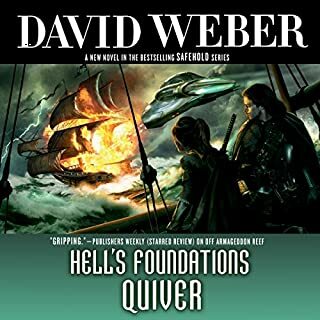 I hope David Weber keeps him for all future Safehold books. Switching narrators can really ruin an otherwise great book. This is a very good book. However the Safehold series in and of itself is rather slow moving forward. It would be nice to see the pace pick up somewhat. 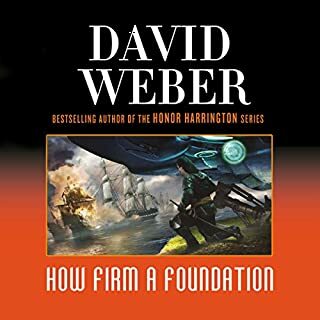 I have listened to all of the Safehold and Honor Harrington books. I look forward to each and every one that comes out in the future! glacially slowly, presumably because Weber spins so many technical details. I think that's part of his charm. But at this rate, Weber will have to be writing from a nursing home by the time he gets to the Gbaba. I don't know why I keep buying this series. I suppose I'm a glutton for punishment. The first 3 books where good yet Mr Webber seems to has lost his way. The story is too big. There are far too many character to keep up with. Seriously you will have to take notes just to keep track of the massive cast written into this story. I keep hoping that the author will find his way back to sanity like in the first books. But that isn't the case in this series. Nothing new happens at all in this series worth mentioning. In my opinion the problem lies in the fact that most of the characters can have conversations via modern technology across great distance now, so the writer has written himself into a corner. So there isn't any great journeys happening, there is no clock ticking in the background giving urgency to the plot. Its just a leisurely stroll of events nobody breaking a sweat as they battle against the vast multitude all the while to antagonist barely makes an appearance. Yes, I would have combined with past four books into one. I will give Weber credit - this book is the best of the past four. However, the series has frustrated me for some time because the author is more interested in long discussions of weapons technology and political machinations over plot advancement. It has been clear for some time how the Safeholdian War is going to end (Its been crystal clear since book 2 or 3). So let's get on with the super-extended appetizer and move onto the buffet - The ultimate fight with the Gbaba. I actually like the technology discussions; however, it has felt like the plot has been on hold for a long, long time. Weber - time to bring it home in Book 8. Nimue returning to the series. Could you see Like a Mighty Army being made into a movie or a TV series? Who should the stars be? Narrator is terrific. I believe that Wyman has done the entire Satehold Series. He is top-notch. I like the narrator in this one. Less than 1/3rd of the way through the story so this review will be updated once I finish it. I want to say: I bought this solely because of the return of Oliver Wyman. Except for either Book 5 or 6 which was nothing but meetings, the series has been very enjoyable. I was willing to tolerate a single change in narrators, but I wasn't that impressed with Culp and absolutely unwilling to tolerate another narrator change (to Keating, or later to Collins). 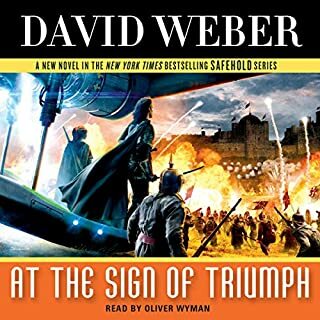 However, with the return of Oliver Wyman, I'm quite happy to resume purchasing this series in audiobook format. Another review update is forthcoming when I complete the book. Could somebody convince Weber or MacMillian to re-do books 5 and 6 with Oliver Wyman. When reading those books; the spelling of names and places is so strange you can't sound them out. When listening to them, the pronunciation was so bad you didn't know who was talking about what. Now that they're back with Wyman, the continuity, and the series is shot. What made the experience of listening to Like a Mighty Army the most enjoyable? The relief of a good performer doing the book right. 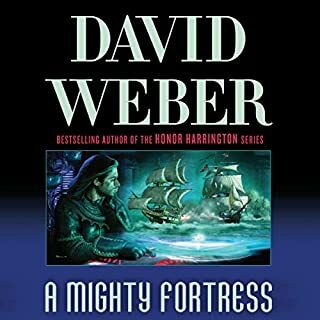 What other book might you compare Like a Mighty Army to and why? The lost fleet, beyond the Fronteer , Dreadnaught. When the reborn Nimue finds out she has a "brother"..
Not really, that ain't my thing. Eagerly awaiting remakes with mr Wyman as storieteller. The writing is tauter than the last book, which is good because the series is getting bloated. David, it is time to bring this series to a conclusion. What isn't good is that this book demands maps. There are constant references to various towns and terrain and the ways in which the forces are trying to out flank each other. Without access to the maps (which I assume the printed version includes) I just gave up and skipped over pieces of the plot that relied on geographical information. Buy the book. Or photocopy the maps from the book at the library. Or, better yet, take it out of the library.